Who does not dream about home with a beautiful garden? Projections what a beautiful garden is, are different. Someone dreams of a romantic garden with fragrant roses, someone else about rustic garden, where are the most important vegetables and spices. Garden is dependent of individual's wishes as it is possible with right approaches to achieve almost every dream garden. Only realistic enough dreams are needed and enough will to work. Gardening is an ongoing process that never ends. The garden is, although usually artificial, more or less natural and is subordinated to the laws of nature. Nature is constantly changing, so is garden. Plants grow, reproduce and compete with each other for light and space. Different animals will find home in garden or will visit it regularly. If the garden is let alone to itself, sooner or later will be in a natural balance. Some plants will prevail, while others will fail. Although can be such a garden very interesting, but from the point of view of the family is useless, because it does not serve its initial purpose: environment for relaxation, socializing and enjoyment. Garden is an extension of the home. Only through constant interventions can we ensure that grass will be of appropriate high, trees will yield rich , and flowers will not overgrow the lawn. 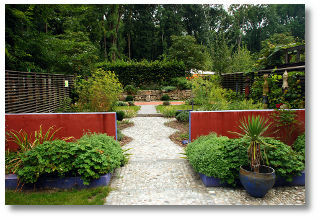 Time that we have to devote to the garden depends on garden style, garden's variety, its size and selection of plants. If we arrange a lawn and planted one or two trees, we will not have to work much. We will have to mow grass Regularly and occasionally fertilized and ventilate it and during dry periods water it. If, however, we planted many perennials, annuals and biennials, created vegetable garden, raised pond and planted many fruit trees, we will have a lot of work with maintenance. Large gardens require a lot of time, in the season more hours every day. If we do not have enough time, then we should arrange garden in a way that it will not require much of our work. We can always hire gardener who will take all the care for garden. organization of spaces for socializing. The work does not end here. Garden needs constant maintenance and will never be finished. You may later get new ideas, maybe you will not like something and the garden will be transformed. Gardening is always linked with love for nature and plants. Gardens, which are not kept with love, can be very beautiful to look at, but do not have the attractive warmth and familiarity. They act as parks. Garden created by professional gardener can look completely flawless, but it will lack connection with owner. If the primary purpose of the garden is to be decoration of the house, then choosing professional gardener is definitely a good decision.